Sometimes you discover the most intriguing things purely by accident. Of course, the accessible nature of social media apps makes it easy to stumble across the works of an unfamiliar artist simply by tapping a few random Instagram links in success. 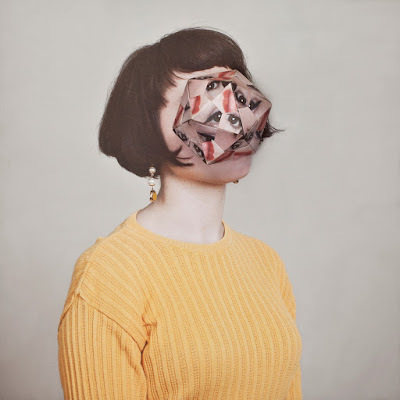 I found Alma Haser in precisely this way: through a winding chain of Instagram posts until a few images from her Eureka Effect series caught my eye. Haser's primary medium is photography, but breathtaking photographs are a dime a dozen on Instagram these days. What makes Haser's work stand out is her surrealist approach to the portraits she takes, where she distorts the features and bodies of her subjects in ways both whimsical and grotesque. Her recent works involves turning her twin photographs into puzzles, which she then disassembles and reassembles with images of the subjects' twins, creating an uncanny, often jarring impression. 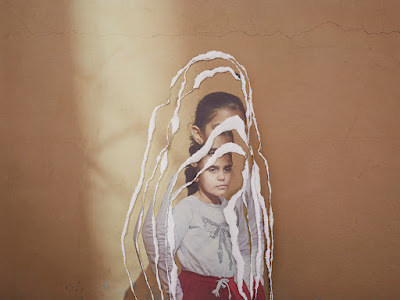 While technology has helped her images spread like wildfire, Haser's tearing, cutting, and other methods of paper manipulation keep her rooted in the classic hands-on aspect of artistic practice. How did you evolve your work from being largely realistic to incorporating more aspects of surrealism and collage? What spurred you to use other techniques aside from photography on its own? I think I always wanted to challenge myself and not just end after taking the first initial photograph. I personally love art that challenges you [and] makes you double-take and guess again. I would say that's where my passion [came from]: for taking it a step further and adding more and more elements until you unsure where it all started. Can you talk about your artistic training? What artists/teachers/mentors have been particularly influential in developing your technique? I see a little bit of Wayne Thiebaud in how you create your compositions, as well as your use of color. Thanks for introducing Wayne Thiebaud to me! I love his work and can see what you mean. I went to university to study photography, but came from a fine art background. I used to paint and make sculptures in college, but then decided my real passion was in photography. Both my parents are artists, so that probably influenced me quite a bit. My mum was the one who got me into photography, actually. She used to do pinhole photography, and would often take pictures of me and my brother. We'd have to lie still for 10 minutes to get the exposure and then we got to witness the picture being processed. It was like magic! I would say a lot of my techniques come from failed attempts. I will have an idea, but it turns out to be way too elaborate, and I'll give up. Then a few days later I'll return, and see the parts in a fresh light and realize it's actually something amazing--something completely different [from] what I was trying to create. You have to have a very open mind, and not be set on one outcome. In terms of composition, I would say I have been hugely influenced by Balthus, with is odd perspectives and colours; Ermin Wurm, who is just brilliant; and director Roy Andersson, who dark humor I love! What led you to use photography as your primary medium? Do you also paint, draw or work in other media? Photography is the medium that holds all my work together. I do paint, and draw... as well as fold, rip, crumple, weave. But It always starts and finishes with a camera. I don't want to limit myself to just photography, as I love making and using my hands. I'm not a huge fan of photoshop, so wherever I can, I will try and use other techniques. The commissioned art you recently did for the Clark album Death Peak is particularly haunting and striking. When you work with musicians, what is the process like? How much collaboration between the themes of the music and your own artistic goals is there? Clark saw my Cosmic Surgery series on the cover of GUP Magazine, and then got in touch with me, asking me if I could do something similar for him. This was 4 years ago! It's been a real pleasure to continue working for him on 3 different albums. We would always discuss the theme of the album. Often I only had the title and a few tracks to work from, so it was always a very open brief. He would let me experiment, and play around with a few ideas, before finding that sometimes the most simple idea is the most haunting and effective. For example, the Death Peak cover [...] was the last attempt. We were both not feeling [good about] any other the tests I had made, then almost in desperation I crumpled his face in my hand, and started to unravel it. It made him look so different, in a good way. So I sent him a snap of it, and he loved it! Your portraits of children with the cake pans, straws, and cupcake holders around their necks like ruffs are delightful. How did you develop that idea? It seems like you've channeled 16th-century portraiture (Holbein, for example) but interpreted it in a more kid-friendly style. The kid portraits were a private commission. The mother wanted me to photograph her children in an unusual and fun way for her husband's birthday present. I thought it would be fun to involve some props, to allow the kids to develop characters, channeling regal, proud and important. So I made them neck ruffs, made out of everyday things, like aluminum cake tins, straws and paper plates. How did you become involved with the Save the Children campaign? What was the process of creating the images for this cause like? Save The Children contacted me early this year, when I happened to be really busy. I didn't want to turn down the project as I thought it was extremely important and I thought I could give a completely different feel to the campaign. I asked my partner, Nick Ballon, if he would go to the Turkey border to photograph the children. I trusted him completely, and knew he would be able to capture them beautifully. When he came back we did a relay of the images, which I then printed out and adapted to try and convey the pain these children were feeling. 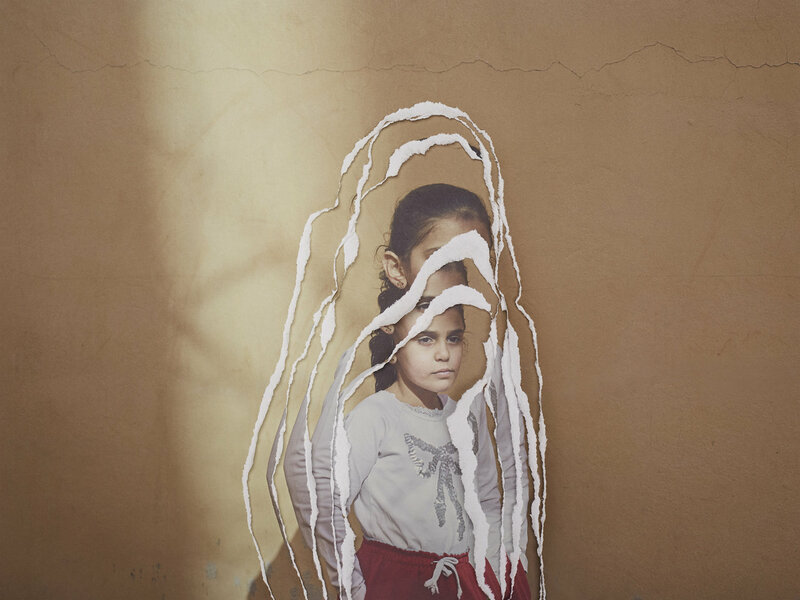 The series was about mental pain, and the effect of the horrors and bombs that had forced them to leave their country. To me the best way to convey this [sentiment] was to use tactile techniques, such as crumpling, ripping, and origami shapes. At the beginning of the project, we thought the photographs would be the strongest element, but I think the animations are even more haunting and effective than we expected. What is the story of the Twins series? The Eureka Effect series? 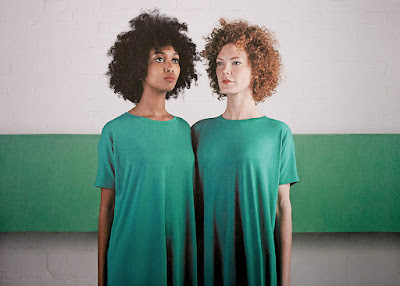 The Twins series features two girls who mirror each other's every move, trying to become one. Twins have always fascinated me, their closeness in looks and attributes. Jess and Mona are of course not twins, and didn't even know each other before the shoot. So the project turned into a series about, the hidden form and echoing each other's movements. I was interested to see Jess and Mona would react together and if they could form the same bond as seen in real twins. The first shoot in the studio, concentrates on their shape and interaction together in a more staged environment. The second shoot incorporated the outdoors, forest, fields and natural light. This reflected on how close they had become and their ability to really imitate each other. They called themselves the "Afro sisters." Thoughts and ideas come and go from our minds. We forget things and often remember again when we enter a dream like state. In The Eureka Effect I explore this idea: the here and there of a brainstorming mind. I use flowers and foliage to represent the new growth of an idea, which seeps its way out of the subjects, as if they were just coming across a "Eureka moment." 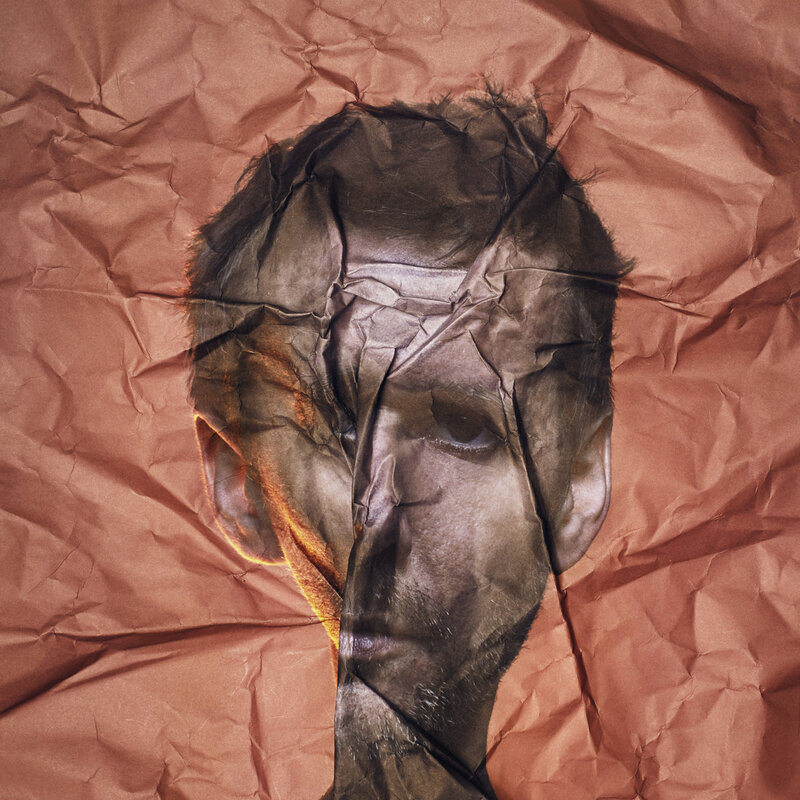 The series is produced by multiple images, which have been cut and collaged together using a technique of re-photographing, and scanning. Do you use professional models or friends in your work? Most of the time I will use friends, and occasionally I will see someone in the street or pub that I just have to ask and see if they will be part of my work. I have also now started stalking people on Instagram that I think would really suit an idea I have. How much of your shoots are improvised, and how much is staged and planned beforehand? I will always have an initial idea when I start a shoot, but it may have completely changed by then end of it! If I am doing something completely new that I have never tried before, and it's a paid commission, I will do a lot more planning and testing before the shoot, but normally I like to just come to the shoot with a model and a few images in my head. How did you come up with the Dog Photobooth project? How do the dogs compare to people as sitters? Is there any commentary there, perhaps, about how pet owners today tend to treat their pets like children? I was asked last year if I would be interested in doing a pop up dog photobooth. I had never done anything with dogs, but since we had just adopted a dog I jumped on the idea. Pina was my first model (the dog in the flower collar). She was the poster girl. It then just took off from there. I started my own little side photobooth, and started taking it to events. It's completely different [from] everything else I normally do, but maybe that why I love it. Also, being around so many dogs is a joy for me! The only slight problem is working with the dogs' owners, who can be quite difficult. Asking for odd requests... like "can you photoshop out all of the slobber" or "is it possible to try and get him to not have his tongue sticking out, is that something you can sort out after?" Dogs are dogs, they are great, but their owners will always have there certain view of how they should look. I feel like dogs are the children that never grow up, that always give you love and stay dependent on you, so that's probably why the dog photobooth has been so popular. I first found you through Instagram and was drawn to your puzzle portrait photos. Can you talk about the process of conceiving of this project? Well, this project is in very early stages [...] I can spend hours putting together a puzzle and be so content while doing it. 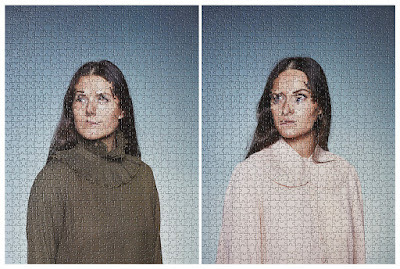 I found out you could get the same die-cut on different puzzles, so I thought it could be really interesting to combine the portraits of identical twins and identically cut puzzles. And, me being me, I had to add an element of surrealism and confusion by swapping some of the face pieces with each portrait. I didn't realize how well it would work! So that was the first in the series, and I have quite a few more twins to photograph and turn into creepy puzzles now. The aesthetic of series like The Eureka Effect, with their clear images and bright colors, seem like they would lend themselves very well to advertising, particularly in a magazine like Vogue. Have you ever considered collaborating commercially in this way? Yes of course, I used to have a commercial agent, but I think it's sometimes hard for people to see how my process could work. I never got a commercial job from them, so decided to stick to making my own work, and occasional commissions. The commissions I attract end up being freer, and they'll come to me for my style and technique. My work tends to look quite soft and textured because of my process of re-photographing, and that isn't everyone's cup of tea. Not in a world where most things require to look sharp, crisp and high contrast. What has been the most memorable moment of your artistic career? I guess that would probably have to be when I was selected as one of the winners in the National Portrait Gallery Taylor Wessing Portrait Prize. I had just finished university and it was just so unexpected! There was a bit of a space between then and last year I guess. But then when The Photographers' Gallery took me on and gave me my first solo show, that was the moment I thought, "maybe I could really make it as an artist..."
What do you hope people who see your work take away from it? Joy, inspiration, excitement, and confusion. I enjoy making the work, so I guess I just want people to sit back and enjoy it.